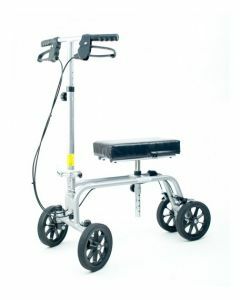 A knee walker or a knee scooter is a three or four-wheel mobility aid that comes with unique benefit of providing an alternative to standard walkers, canes and crutches. In one word, a knee walker is an advanced version to traditional walking aids. This device allows users to propel themselves with one leg, while the other one on a support platform. 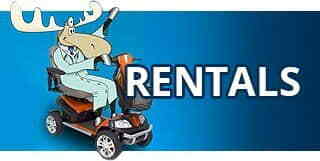 These devices are available for rental at the best price and are ideally suited to individuals who find it difficult or rather impossible to bear weight on the temporarily injured or permanently disabled leg. A crutch alternative for patients who either cannot or choose not to use crutches. The first unit with LOOP HAND BRAKES! Includes new larger FREE vinyl pouch to store belongings. Wide flat free tires give extra stability. Ergonomically designed, Lightweight Steel frame that is silver in color to hide scratches. New folding mechanism makes transporting unit a breeze. Adjustable tiller & knee pad to accomodate different user heights. Having an injury or major surgery on foot or ankle isn’t easy. With restrictions and limitations put on bearing weight with mobility difficulties will hamper your everyday life and living activities. We at Affordable Medical Equipment are here to help you forget your disability and assist you get back in motion and continue doing your important daily living activities. Our knee walker and other associate products are specifically designed to get you better faster, keep you mobile and enjoy your independence. Knee walkers are known by several names, including knee scooters, knee coasters and leg walkers. Before this useful device was introduced, people don’t have a lot of mobility options when he/she ever experience a foot surgery or suffered from other issues like foot fractures, gout, and diabetic ulcers. With advancement in technology for medical equipment, if you have problems with mobility and you're looking for a quality device to get around a little more easily, consider getting a knee walker from Affordable Medical Equipment. 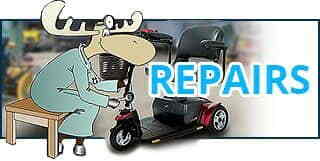 We are one of the leading stores in West Columbia supplying one of a kind medical equipment for various needs. 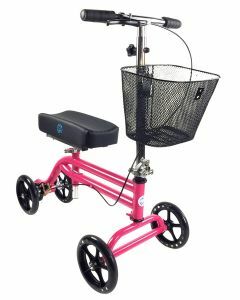 Our knee walkers for rentals are designed to be safe, efficient, comfortable and easy-to-maneuver alternatives to conventional aids like crutches or traditional walkers. Underarm crutches can be stressful and uncomfortable for many people as they put maximum pressure and stress on the armpit area and can often be tiring after prolonged usage. Our knee walkers come with 3 or 4 wheels and it makes it extremely easy and convenient for you to move across flat surfaces and the leg rest area is also comfortable as it rest on a padded space to reduce fatigue. Those who have a hard cast around their foot, a knee walker from Affordable Medical Equipment can be a much more comfortable option than any conventional crutch or traditional walker. Before you make any choice, always bear in mind that knee scooters are heavier than crutches, but they provide the most comfortable support than their previous aid. However, they can’t be used on stairs. To make the device more comfortable, some brands include brakes to their knee walkers so you can stay in control and keep the balance on slopes and elsewhere. We recommend you to look for walkers with storage basket on the front to hold on to groceries and other items while you're out on move. All our repairs are being performed at the Affordable Medical USA Center located at 1538 Sunset Blvd West Columbia, SC 29169. Copyright © 2019 Affordable Medical USA. All rights reserved. | Designed By Capacity Web Solutions.